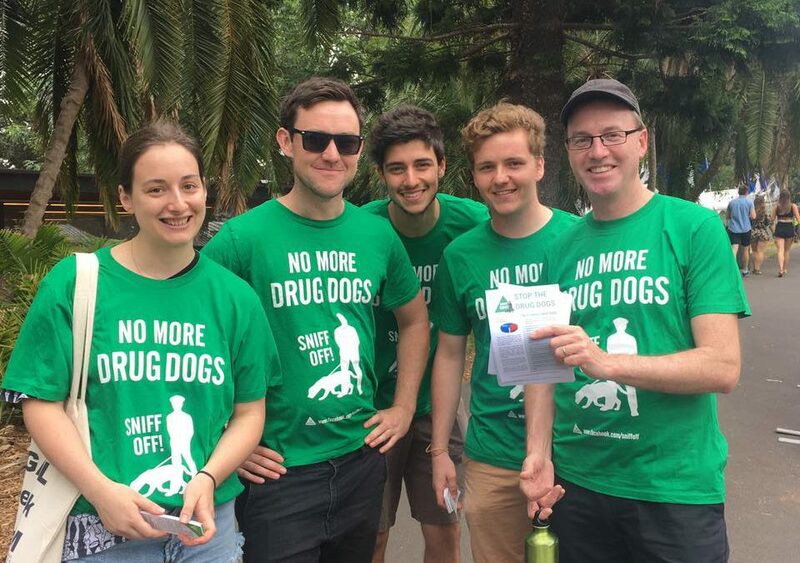 It’s been a huge year for Sniff Off, the NSW Greens campaign against the use of drug dogs at bars, festivals, and public transport! We’ve put out hundreds of updates on drug dog locations throughout NSW, grown from 8,000 to over 25,000 likes on Facebook, and handed out thousands of flyers at festivals, train stations and bars. In March, Greens Member for Newtown Jenny Leong introduced a bill to repeal the use of NSW drug detection dogs without a warrant. Check out her powerful speech here. We caught some naughty police officers lying about drug dog locations on our Sniff Off page. It was later revealed that two officers were on duty at the time, and all three had been involved in drug dog operations. Lying to the public whilst on the clock, tsk tsk. March also saw a lowlight – police officers engaging in racist, sexist harassment of Jenny Leong after she dared to criticise the drug dog program. The Police Integrity Commission subsequently recommended laying charges against officers involved. For the second year in a row, Sniff Off had a presence it Nimbin’s MardiGrass Cannabis legalisation festival in late April/May. We had a great response from the locals, activists and tourists. Greens MP David Shoebridge spoke to a packed town hall about the flaws in NSW’s roadside drug testing regime, and Greens MP Mehreen Faruqi spoke about her trip to the United States and cannabis legalisation. Later in May we launched our Twitter account to accompany our Facebook drug dog alerts. At the end of May, we revealed figures obtained in Parliament by David Shoebridge, showing that $66 million has been wasted on the drug dog program since 2010. In September, we revealed the latest figures on drug dog searches obtained through our freedom of information request – showing a reduction in searches since the launch of Sniff Off. Unfortunately the dogs are still getting it wrong 68% of the time. Later that month data analysis by the Greens was released confirming what was always obvious – poor and Aboriginal communities are disproportionately targeted by drug dog operations. In November Sniff off volunteers handed out thousands of flyers at Harbourlife and The Plot. Our flyers include information on why the drug dog program doesn’t work and tips on interacting with police. This year they’ve been a hit at Laneway, Knockout, Yours and Owls, Listen Out, Splendour in the Grass, Reclaim the Streets, Sydney Mardi Gras and other festivals! Shoot us an email at [email protected] if you’re interested in volunteering in the future with Sniff Off!